HOLLYWOOD, CA (KTRK) -- The first thing that stands out is how nice everyone was. From Jimmy Kimmel to JJ Watt and everyone in between, you could tell they all had a blast doing the skits and laughing together. That said, there were restrictions to protect the Jimmy Kimmel Show. The stage is set up right across from Hollywood High School. Fans lined up to see ZZ Top. I'm a big fan so I wanted a picture of them performing. No go. It's just not allowed until the show airs in the Pacific time zone. Same thing with any photos of anyone who's on the show so we waited in one of the small stages to the side of the stage used to tape with Kimmel and his guests. We could see the show taping live and we could see the great reaction to JJ. 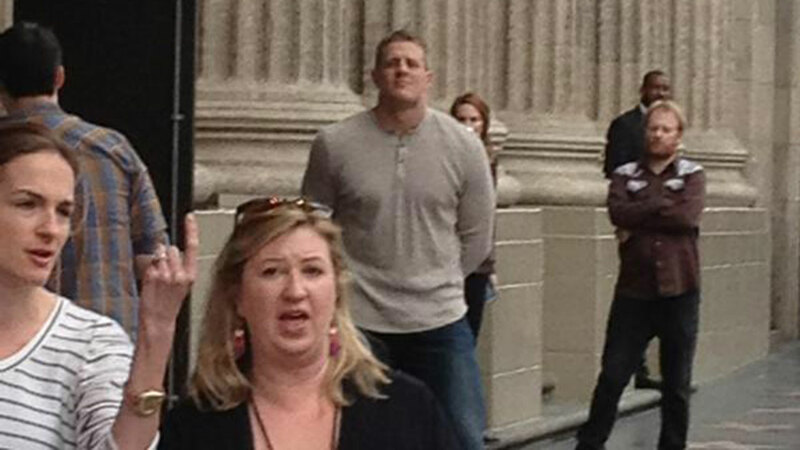 The Texans JJ Watt was on Jimmy Kimmel Live Monday, January 26. He sold out for the coffee skit and had everybody laughing with his stories of his small town life in Wisconsin. After his segment, he changed clothes and talked with us. Loved the Rockets hat he wore for his interview. JJ genuinely likes a lot about Hollywood. It's a new world and he is intrigued with doing more. The huge smile when I asked about a JJ Watt Action Hero series is one that stands out. I tried and failed to get him to commit to the Bachelor on ABC. Jimmy Kimmel was great with us. He was truly impressed with JJ. We talked off camera about how much charity work JJ does. Kimmel knew all about it. Jimmy offered to take a photo with us too. Generous touch. He's pumped to come back to SXSW. After we wrapped up the interviews we wrote our story, edited and went live around the corner. Fun day. Much more to come today on ABC-13.